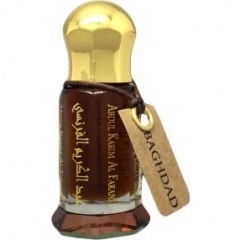 Baghdad (Perfume Oil) is a perfume by Abdul Karim Al Faransi for women and men. The release year is unknown. The scent is oriental-floral. It is still in production. A unisex, very sensual dark rose, full of thorns but impossible to resist, it starts with a bold velvet dark red rose followed by saffron and other oriental spices involved in a very subtle very soft and beautiful indian agarwood which give it that sensual je ne sais quoi. It’s like a love affair, and the drydown, that’s the best part, a smoky velvet rose, very subtle to the skin, this is a very intimate fragrance and like every affair it makes you wanting more, to me the only downside of this fragrance, at least on my skin, it doesn’t last very long (6h more or less), yet I find it beautiful in that way, it leaves me wanting more. Write the first Review for Baghdad (Perfume Oil)!